A UK-wide ban on movement of all livestock is in place after cattle at a farm in Surrey were found to be infected with foot-and-mouth disease. Some 60 animals on the farm close to the village of Wanborough near Guildford have tested positive for the disease which wreaked havoc in 2001. A 3km protection zone has been put in place around the premises. Gordon Brown cancelled his holiday in Dorset and took part in a meeting of government's Cobra emergency committee. Very few human cases of foot-and-mouth disease have ever been recorded. The last human case reported in the UK occurred in 1966. In accordance with legislation, all cattle on the Surrey premises will be culled and incinerated, UK Chief Veterinary Officer Debby Reynolds said. Ms Reynolds confirmed the outbreak after samples were taken from the farm. She said: "We are trying to form a picture of where the infection may have come from but at the moment it's very early stages. "It is the absolute priority at the moment to prevent further spread, and piece together information about how it might have got there in the first place." Scientific analysis of the virus could be available late on Saturday, but it may take longer depending on the exact strain of the disease involved. Gordon Brown returned to London on Saturday and Environment Secretary Hilary Benn broke off from his holiday in Italy. The Cobra committee was reconvened and met for 50 minutes on Saturday to review the latest developments. Ms Reynolds has advised farmers across the UK to examine their animals carefully and immediately report anything suspicious. As well as the 3km protection zone, there is also a 10km surveillance zone where nearby animals are monitored. The outbreak in 2001 led to between 6.5 million and 10 million animals being destroyed and cost as much as £8.5bn. Many farms and other rural businesses were ruined, and the UK's tourist industry was severely hit. 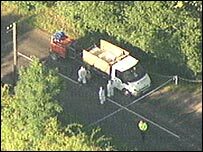 The Cabinet Office Minister, Ed Miliband, said there had been a co-ordinated response to the outbreak: "We have had a contingency plan in place following the 2001 outbreak. There have been exercises in relation to that." He said an automatic European Union exports ban would come into place immediately. A European Commission spokesman said the EC would adopt an emergency decision on Monday "confirming the measures being applied concerning restrictions on the movement of animals and the dispatch of products" from the UK. National Farmers' Union President Peter Kendall said of the latest incident: "We have to ensure this is a small isolated incident. We are working with the government to ensure the right steps are taken." And Hugh Brown, of Surrey NFU, said farmers in the county would be "ultra-vigilant for spotting any signs of abnormality on their farms". Hugh Pennington, emeritus professor of microbiology at Aberdeen University, said: "Speed is of the essence here. "We have got to really stop this virus spreading, obviously first of all to stamp it out in the locality where it has been identified and then see whether the virus has got anywhere else." The outbreak is not the problem. It is the reaction (and response) to it that matters. Tim Bonner, from the Countryside Alliance, said: "Even the words 'foot-and-mouth' will send a chill through the spine of every farmer in the country." The Welsh Assembly government said no link to Wales from the infected premises had been identified. A number of agricultural shows across the UK are going ahead this weekend without cows, sheep and goats, due to foot-and-mouth restrictions. Meanwhile, in Cumbria, one of the areas hardest hit by the 2001 outbreak, the Cockermouth and District Agricultural Show, due to take place on Saturday, has been cancelled. Defra has set up a helpline in response to the latest outbreak on 08459 335577.